Intelligent IP cameras are providing advanced detection capability. Would you like to know the moment when someone takes your laptop? Would you like to know when someone screams in the lobby of your building? How about detecting a gunshot? The latest IP cameras have quite a lot of built-in intelligence. They help protect people and assets. They notify you of dangerous situations, help deter terror attacks, and even tell you how many people have visited your store. The first video cameras consisted mostly of analog electronics. They were mostly amplifiers, filters, and power supplies. Today’s IP cameras are digital and include powerful computers. The computers provide many different functions from processing the video image to connecting the IP camera to the Ethernet network. The latest processors provide analytic functions that dramatically increase the effectiveness of the camera. In the past, we needed security people to watch many cameras, but in today’s complex world we can monitor more cameras with fewer people. Rather than looking at the captured video, the new IP cameras provide immediate notification of alarm conditions. They provide a new level of security for your IP camera system. The Wisenet X-series of IP cameras includes many of these advanced features. The face detection algorithm detects the features of a face which are not affected by rotation, size, angle and lighting changes. It looks for eyes, eyebrows, nose, and mouth. The detection depends on the number of pixels across the face. In most cases, the process will require at least 45 pixels across the face to perform the detection. The latest processor from Hanwha can actually use only 25 pixels, which dramatically improves the range of detection. The computer can detect up to 35 faces at a time. Use face detection to reduce motion alarms caused by animals, vehicles, and other moving objects. It only causes an alarm when a person enters a specific area. The very first analytic function was motion detection. If anything moved in the field of view, an alarm was triggered. It could be triggered by moving leaves, or by a squirrel running across the field. The latest motion detection systems can be controlled by a set of defined event rules greatly reducing the false alarms. With the new motion detection sensors, we can adjust the sensitivity to reduce events caused by changing lighting or other noise in the video. We can also create zones where we want to detect motion and exclusion areas where we don’t want to detect motion. You can use advanced settings of intelligent motion detection if you want to detect vehicles instead of people. You can set the IP camera to filter out the small changes that normally occur. You can also adjust the settings to ignore areas in the warehouse where there is usual traffic, but detect when something moves in the storage area. In some cases, we may not care about general motion. We may only be interested if something unusual occurs, such as a person or object crossing a virtual line. We can set the alarm function to alert us if an object moves left to right, right to left, or in either direction. We can detect if a person enters a secure area, climbs over a fence, enters a restricted area, or even if a vehicle veers off the road. The line crossing function allows you to detect when a person crosses an imaginary fence, or when a vehicle crosses a line. It is a very effective way of responding only to the important alarm. You can use it to secure a storage area, or monitor if a vehicle enters the parking lot. An extension of the line crossing function is the ability to select a closed area, and when an object crosses into (intrusion), or out of the area, trigger an alarm. The same function can be used to determine when someone enters the secure area, or leaves. It also provides the ability to detect an object that is left behind, or even when an object is removed. Objects entering or exiting a closed area can cause an alarm. The Samsung (Hanwha) cameras allow you to set up a number of different closed areas. You can look for an intrusion, objects entering, objects that leave, or even objects that appear or disappear in the selected area. This function is also useful for detecting if an object has been left inside a designated area. A box, or suitcase that appears and stays in the same position for a certain time period can be flagged. Loitering Detection can be used to detect suspicious behavior. The camera looks for similar movements and patterns that are within a designated area. Once the patterns are detected for a certain amount of time, the loitering alarm is triggered. This is an excellent analytic feature for detecting terror attacks. It allows the security team to know in advance that there is a potential threat. If a person or object suddenly appears in a secure area, the camera creates an alarm. This allows the security team to take immediate action. If an object, like your laptop computer, is removed from the desk and is absent for a certain time, the security people can receive an automated alert. Quick detection allows you to catch the thief before they leave the building. This is a nice feature that allows you to detect suspicious activity in a designated area. You may not want a person hanging around the school yard, or waiting outside a loading dock. This feature warns you to take action before the crime is committed. The addition of audio analysis makes the IP camera even more powerful. It adds another level of protection. This technology detects audio levels that exceed certain defined levels. Now you can detect abnormal situations without seeing any troubling video. When the security operator is notified, they can take a better look at the video to confirm the problem. The combination of audio with video dramatically improves safety. This detection system first listens to the general background noise. When a sound level exceeds the normal background noise the computer system can analyze the sound to determine what type of alarm should be sent. The analysis can determine if someone has screamed, or if there was a gunshot. It can even tell if there was an explosion or crash. The operator can select the type of sounds it would like the system to respond to. Audio detection can be used in the lobby of a building, or even in an elevator, to detect screams. The IP camera system not only can see and record vehicles in the parking lot, it can be used to quickly notify you about accidents in the lot. 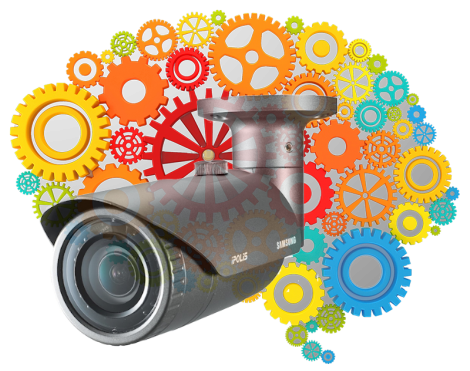 IP cameras have become very intelligent. They analyze the video and audio to provide reliable alarms. The analytic capability provides instant notifications with less security personnel. The immediate alarm capability provided by camera analytic functions, allow the security people to respond very quickly to threats. Analytic functions include both video and audio analysis. Today’s motion detection algorithms have become very sophisticated and reduce false alarms. It makes our world safer. To receive help selecting the right IP cameras, please contact us at 1-800-431-1658 in the USA, or at 914-944-3425 everywhere else, or use our contact form.